The green area of the map is under a flood watch, according to this National Weather Service map updated Wednesday morning. The coast is also under a high wind advisory. A sailboat broke its mooring on the Owls Head side of Rockland Harbor and was pushed against the rocks Wednesday morning. GRAY, Maine — As a fall nor’easter brought heavy, windswept rain into the state Wednesday, one boat ran aground in Rockland and another vessel sent out a distress signal as it was taking on water in high seas off Matinicus Island. No one was injured in either incident and the distressed vessel later reached safe harbor. Through Friday, the slow moving nor’easter was expected to dump between 2 and 4 inches of rain on much of the state and in excess of 6 inches in some areas, according to the National Weather Service. The heaviest rain was expected late Wednesday into Thursday. While rain wasn’t expected to fall at extreme enough rates to cause flash flooding, the amount expected over a multiday period could cause rivers to rise to flood stage, the weather service warned. All areas of Maine, with the exceptions of Aroostook County and northern Piscataquis, Somerset and Penobscot counties, were under a flood watch Wednesday morning. 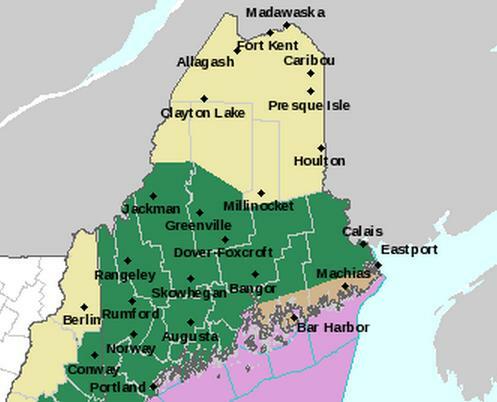 The flood watches were in effect through the end of the day Thursday for southern parts of the state and through Friday morning for central and eastern Maine. Nearly 4,000 Central Maine Power officials were without power Wednesday evening as high winds caused a few outages in each of the 10 counties in its coverage area. Only 250 Emera Maine customers, mostly in the Ellsworth area, were without power at about 5:30 p.m. Wednesday. “The storm is expected to have the greatest impact from about 8 [Wednesday] night until noon Thursday, and we anticipate isolated weather related power outages,” said Lisa Martin, Emera Maine manager of line and meter operations. Both utilities warned customers to stay clear of downed power lines. Gov. Paul LePage also urged Mainers to stay safe. Strong winds also caused problems for mariners along the coast. The weather service issued a warning of gale force winds in effect through 8 a.m. Thursday along the coast from Stonington south. The notice warned mariners of possible northeast winds of 25 to 35 knots with gusts up to 40 and 10- to 15-foot seas. U.S. Coast Guard Chief Carter Seigh of the Rockland station said the vessel Southern Skies was found about 4.5 miles east of Matinicus when it sent out a distress call shortly before 11 a.m. He said another fishing boat in the area reported seas of 10 to 12 feet and the weather buoy on nearby Matinicus Rock was recording winds of 40 knots. A good Samaritan fishing vessel reached the Southern Skies about 11:30 a.m., the Coast Guard chief said. Seigh said two windows on the pilot house of the Southern Skies broke and water was coming in that way. How the windows broke was not immediately known. A 47-foot Coast Guard vessel with dispatched from Rockland, but the fishing boat in distress still had power and was able to make it to Criehaven by early afternoon while accompanied by the other fishing vessel, according to Seigh. Criehaven, which also is known as Ragged Island, is next to Matinicus and about 22 miles off Rockland. 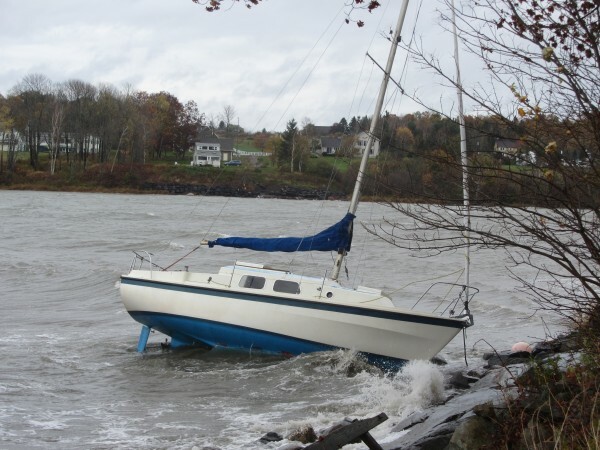 The nor’easter also was blamed for a sailboat breaking its mooring in Rockland Harbor on the Owls Head side. The sailboat was on the rocks Wednesday morning at the end of Island View Terrace in Owls Head. The owner, a local resident, was trying to find someone to help pull it off the rocks, according to Rockland Harbor Master Ed Glaser.